gotta make a move to a town that's right for me... gotta move on... to Crack Town!!! How does it feel to be without a home, like a complete unknown... like a rolling stone? there must be some way out of here. said the joker to the thief... too much confusion, I can't get no relief. 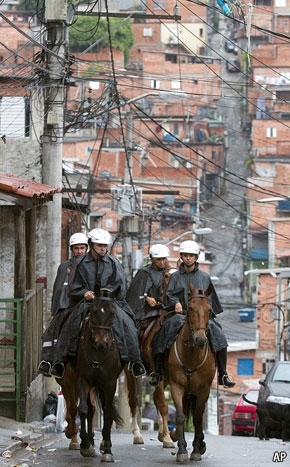 Mounted police in Favela Paraisópolis - 2012. 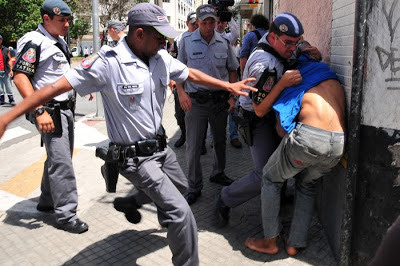 Governor Alckmin's police brutality against crack users in Sao Paulo - 2012. Conservative governor Alckmin doesn't have a clue about anything... except send in the troops. The Guardian, Thursday 9 May 2013. Some call it a human zoo or a horror show, others a zombie tourist attraction or Brazil's shame. 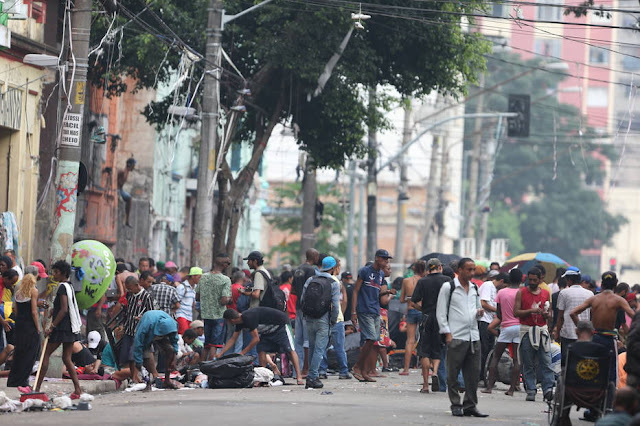 But the most common name for the district south-west of São Paulo's Luz station is Cracolândia. Drug users, many wrapped in dirty blankets, lie on the pavement or are slumped on stained sofas. Others shuffle along the road, seemingly oblivious to their surroundings. Nobody bothers to conceal the main reason they are here: crack cocaine, which is smoked openly and everywhere in white, single-hit balls that cost from three to 10 reals (£1 to £3.30). Just over a year ago, this area in the heart of South America's largest city was considered so dangerous that it was practically a no-go zone even for the police. 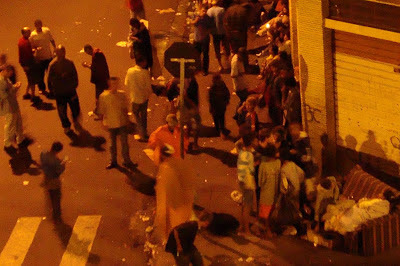 Studies suggest one in three people died within five years of ending up on these streets, usually violently. 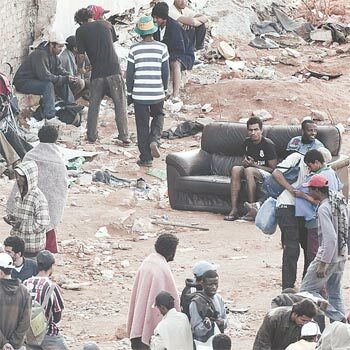 But with Brazil now gripped by the world's second biggest crack epidemic (after the US), the authorities have launched a series of controversial initiatives to address this very visible symptom of the country's social ills. Since the start of last year, São Paulo has introduced street clearance operations by police, increased funds for rehabilitation centres and, most recently, focused more on judicial intervention and involuntary treatment. Supporters say such measures are steps towards a solution of one of the city's worst problems and a long overdue allocation of resources to help those who have fallen as low as you can go. Critics, however, argue that the policies are haphazard, shift with the political winds, often violate the rights of the users and may be driven by business demands to clean up a piece of potentially valuable land. 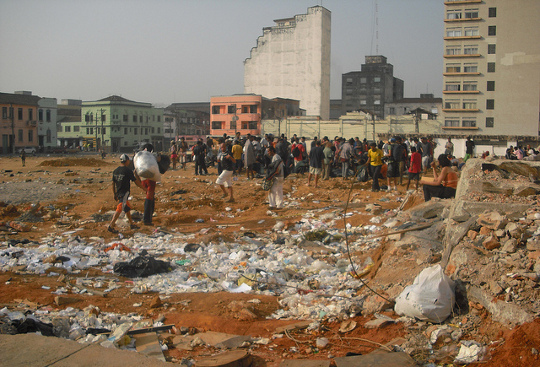 In the 1990s, São Paulo was the first city to report a crack problem in Brazil, but the problem has spread with economic development: nationwide, usage is thought to have expanded tenfold since the turn of the century. 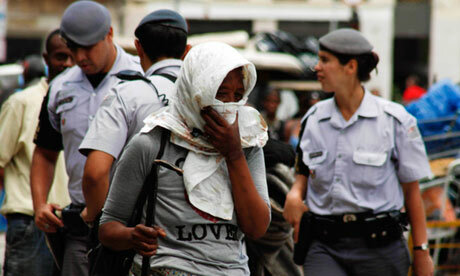 Many in Cracolândia have tales of sexual or physical abuse, or a long history of addiction in their families. Chris, 17, came to São Paulo from the north of Brazil 10 months ago to look for her mother, a crack user. All she found was addiction. She first tried cocaine when someone offered it to her at a party and she became addicted. She checked herself into a rehab centre, but then a dealer came to the gates of the facility. "They only had crack, but I craved a high so much at that time that I took it, even though I knew it was dangerous," she said. 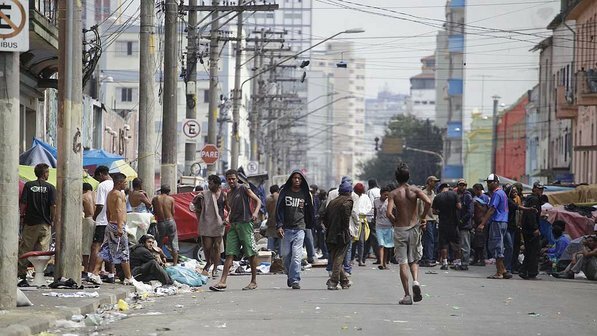 Now, she is constantly running away from the treatment centre to get high in Cracolândia, which is just five minutes' walk away. 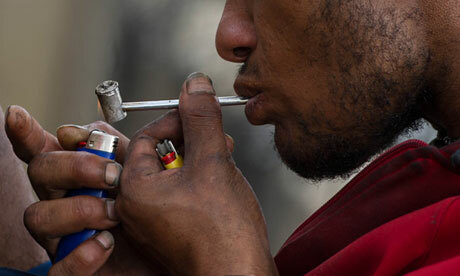 A man smokes crack openly. 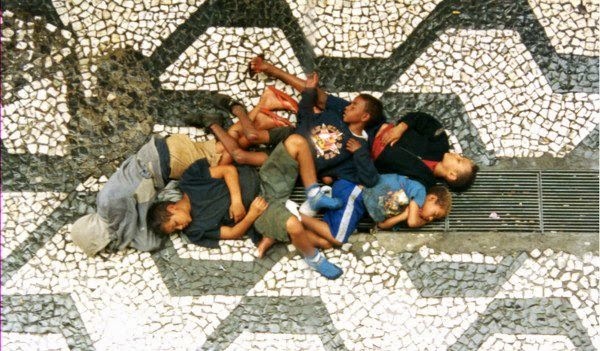 Studies suggests one in three people died within five years of ending up on Cracolândia's streets, usually violently. Photograph: AFP/Getty Images. 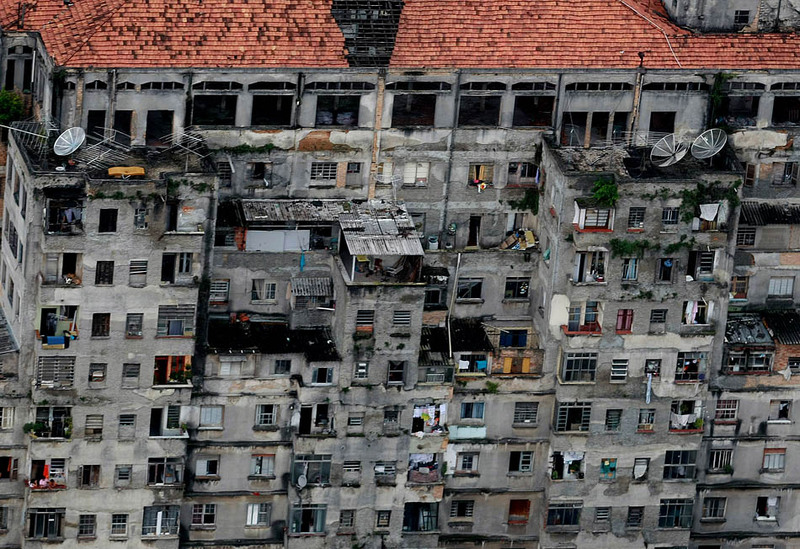 No reliable statistics exist, but at its peak, Cracolândia was thought to be home to about 2,000 users. Today, at its busiest – 2am on a Friday night – there are closer to 800. Instead, crack users are increasingly evident in other parts of the city centre, such as the park next to the Sé Cathedral. There are also moves to detain and treat more addicts. 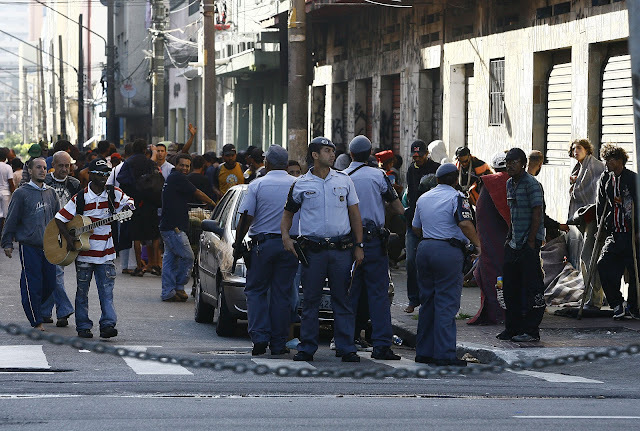 "Cracolândia is shrinking because of police and media attention. It's less visible now, less of a horror-show tourist attraction. 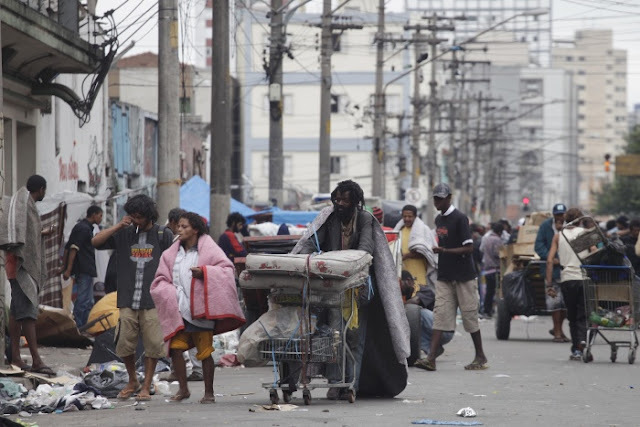 But instead of one big Cracolândia, you now have many small Cracolândias," said Samuel Karasin, a judge working at a state rehabilitation centre. He said his transfer to the facility in January was a historic initiative by the São Paulo court to press local authorities to live up to their legal obligation to provide health treatment for all citizens. Family members should now get extra support from lawyers and quicker decisions by a judge when they are asking medical staff to intervene in the cases of addicted children, siblings and parents. "It is the first time that a court has taken proactive measures to deal with an issue of poverty and drug addiction," said Karasin. "When we started, it was like the bursting of a dyke. So many people came in. In the first few days we had thousands." The change is partly due to politics. São Paulo's new mayor, Fernando Haddad, a former education minister, announced in January that the city would make more use of compulsory intervention. Since the announcement, there have been 33 involuntary detentions, though officials say most later agreed to their treatment. "The project is that if we need to use compulsory intervention we will, but we would rather convince them," said Rosangela Elias, mental health co-ordinator for São Paulo state, who is working on a new two-year plan to help more users. 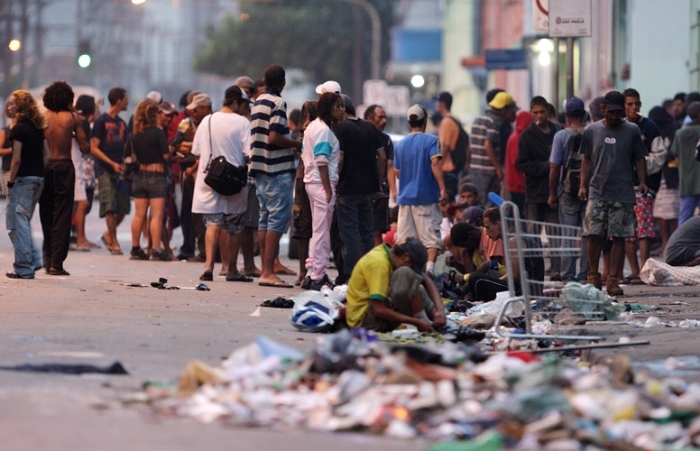 "Our aim is not to clear up Cracolândia. Our aim is to treat people." But she acknowledges pressure for a cosmetic solution. 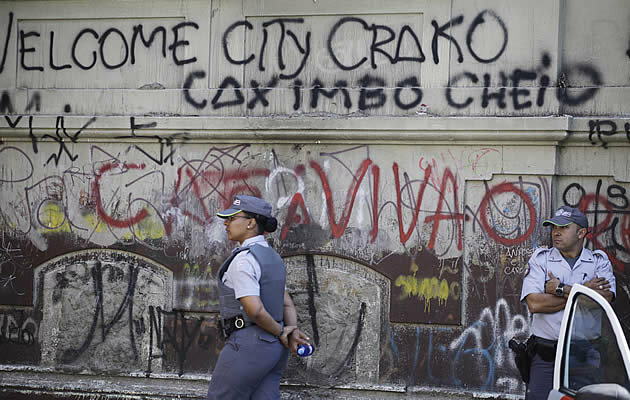 "You cannot just wave a wand and make Cracolândia disappear, but politicians and business people push us to find a magical instant solution." The city government wants to redevelop the district. It has invested billions of reals in a new Portuguese language museum and has plans for a new art school. Haddad says he will also provide social housing for street dwellers. The government also hopes to attract private capital to build residential accommodation. But that's difficult, when the few existing local businesses complain of constant thefts and violence from the drug using community. At the local dry cleaners, the staff say they have lost count of the times they have been robbed. "The new mayor is promising to remove the crackheads from here and provide shelters for them all. But I don't believe he'll do anything. It's just a campaign promise," said Maria de Lurdes Marques, an employer. Under the previous administration last year, the police launched a campaign to arrest dealers and evict homeless people from public buildings. Street dwellers say the measures were brutal. 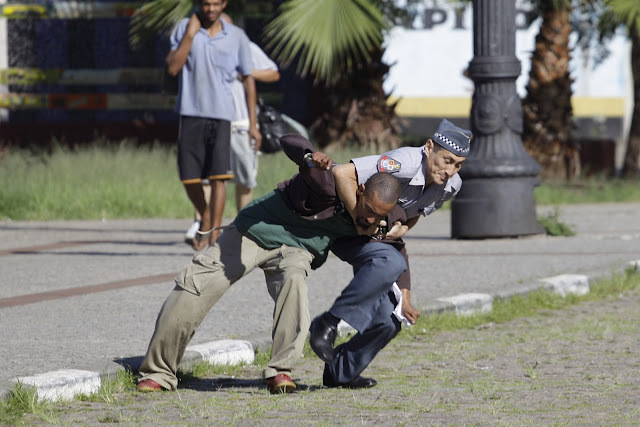 "I was asleep and the police pulled the blanket off me, then, when I complained, they beat me. They broke three ribs," said Washington Luiz Maciel who lived on the streets for 20 years. "They are still trying to clear us out because local residents and businesses ask them to get rid of us." He was doing up to 40 hits of crack a day at one point. Now he is in the Complexo Prates rehab centre and has been clean for several months. The facilities are impressive. There is a health unit that sees around 100 cases a day for assessments, prescriptions of antidepressants, counselling sessions and various types of therapy. 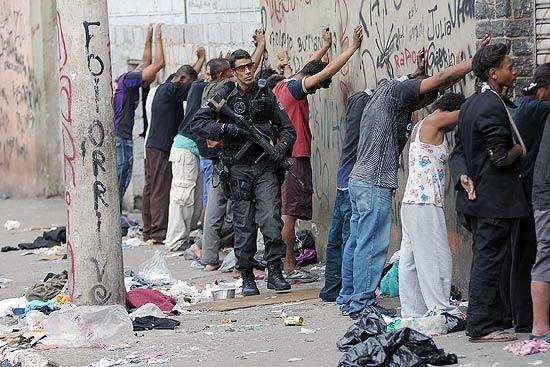 Brazil's military police carry out an operation to remove drug users and arrest dealers in São Paulo in 2012. Photograph: News Free/CON/Getty Images. Residents, who come voluntarily, can play dominos or table football, take art classes or study to ready and write. There is a computer room, table football, dormitory accomodation for 110 adults and 20 juveniles, as well as a dining room that serves four meals a day. Myrtes Cavalcante, mental health coordinator for the central west region of São Paulo believe the crack issue has been hyped by the media. There is not a big increase in users in São Paulo and compulsory intervention is not a new development. "We are treating more and hosting more. We're containing the problem. It's not getting worse", 'she insists. 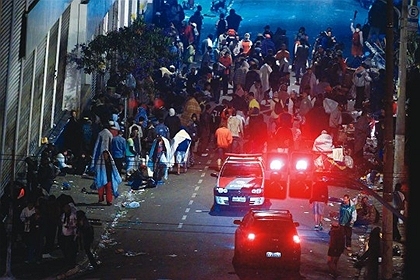 However, the health minister Alexandre Padilha says the nationwide situation is at epidemic levels. Last December, Brazil's president, Dilma Rousseff, announced a 4 billion-reais plan to tackle crack addition through education, training and the provision of more rehabilitation staff and beds. But it has got off to a slow start. 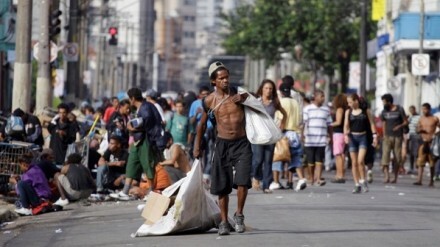 São Paulo - which aims to be a model - has only 700 beds available and expects to increase that number to 1,100 next year. Shortages are even greater elsewhere. The biggest growth areas for the drug now are in the inland and northern provinces, many of which now have their own Cracolândias. Critics say a fundamental flaw in the approach by the authorities is that they have not properly assessed the scale of the problem or conducted studies to monitor the effectiveness of different types of treatment. There is also little coordination between different branches of government. "The money is being spent on nothing. It makes me so angry," says Ronaldo Laranjeira, director of the National Institute of Alcohol and Drug Policies at the Federal University of São Paulo. "When I talk to my colleagues in the government, they don't have a clue. I don't think they have a plan at all. It's a mess. Implementation is chaotic." Cracolândia is as low as you can go in society," he says. "It is an aberration that would not be allowed in any other country. We have to get these people off the the streets." Laranjeira supports compulsory intervengtion on the grounds of equality. Currently, he says, involuntary intervention is mostly only carried out for users from middle-class families, whose parents or siblings pay doctors to prescribe a period of treatment. The same support should be available to all, the government adviser says. "In extreme cases, crack users need involuntary treatment. This is not a punishment... This is not an issue of freedom or long-term incarceration. These people are really sick. 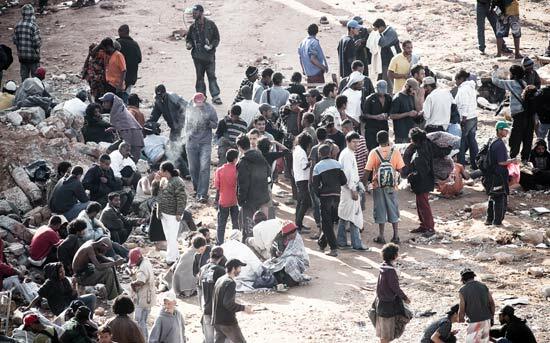 They need short-term treatment for a month." It is hard to find crack users who agree. "I think treatment should be compulsory. As a user, I know how good the drug feels and how hard it is to reject it. When you are on the drug, you can't control yourself," says Chris, who is now back in rehabilitation. Full of youthful energy, she grins and gesticulates as she talks about her struggel to start afresh. "I fell better. I've been clean a week now. The staff here are like mothers to me." There is clearly a close bond between them, but next week, Chris will turn 17 and then she can no longer be treated as a juvenile. That means a lot less government support and a heightened risk that she will end up back in Cracolândia. At the moment, she feels there is nowhere else she can go, including her old home. "If I went back, it wouldn't help. My entire family is addicted." With the Cracolândia community dispersing, Chris is also resigning herself to not being reunited with her mother any time soon. "She said she'd be with me for my 18th birthday, but I don't knwo if that is going to happens." artigo de Vitor Hugo Brandalise publicado no jornal O Estado de S. Paulo de 10 Dezembro 2010. 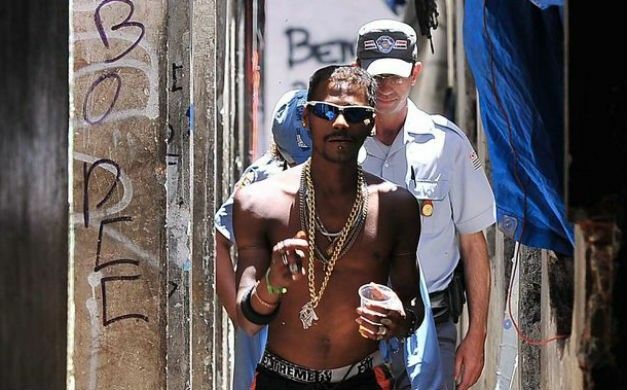 Pesquisador de crack há 25 anos, ele acha que em outros países as áreas de uso de droga são mais violentas que em São Paulo. Símbolo da degradação do centro de São Paulo, a Cracolândia é uma área amistosa. Pelo menos quando comparada a locais de viciados de outros países. É o que garante Philippe Bourgois, antropólogo norte-americano. Autor de 2 livros sobre cocaína crack e estudioso de regiões tomadas pela droga nos Estados Unidos, França, Canadá e Colômbia, percorreu a Cracolândia paulistana pela 1a. vez por hora e meia. E concluiu que se trata da 'mais sociável e amigável cena de crack' que já visitou e isso pode ser uma vantagem na solução do problema. Eram 15 horas quando Bourgois parou na frente de uma roda de samba formada por usuários com cachimbos no bolso e bumbo na mão, que comemoravam um aniversário. Intrigado, ele observou as 70 pessoas na esquina da Alameda Cleveland com a Rua Helvétia. Dançavam e fumavam crack. Bourgois pediu uma média com leite no bar da esquina, encostou na parede e, em pouco tempo, foi rodeado por usuários. Um deles falava inglês fluentemente. 'De quarta-feira em diante, o pessoal festeja para esquecer de tudo nesse sambão', contou Carlos, ex-gerente de restaurante em Porto Alegre, na Cracolândia há 2 meses. A espontaneidade do samba, os sorrisos e as piadas surpreenderam o antropólogo, que há 25 anos pesquisa o crack e se acostumou à violência de Três Esquinas, em Bogotá, na Colômbia, objeto de seu último estudo.
. Qual sua impressão sobre a Cracolândia? É, com certeza, a mais sociável e amigável cena do crack que já presenciei. Nada do que vi parece com o que há aqui. Não se vê em outros lugares esse nível de relaxamento e sociabilidade, pessoas fazendo música, enquanto fumam crack. Muito impressionante. Em Amsterdão, há algo parecido num espaço próprio para socialização, mas é local assistido, com enfermeiras. Aqui é espontâneo.
. Como isso pode ser benéfico? Qualquer ligação com a a realidade que resgate humanidade ajuda o viciado a deixar o vício. Aqui parece claro que se deve usar a música e o caráter sociável do brasileiro. É realmente algo difícil de encontrar em outras cenas. Deve ser estudado e utilizado na busca por soluções. Uma estratégia de redução de danos é diminuir o ritmo do crack, fazer com que as pessoas fumem menos. É interessante perceber que aqui isso acontece quase naturalmente. É comum ficar completamente destrutivo fumando crack. Aqui, no meio de 70 pessoas, a maioria ainda era capaz de sorrir e conversar. Traz esperança de que o Brasil pode achar formas de lidar com o problema. 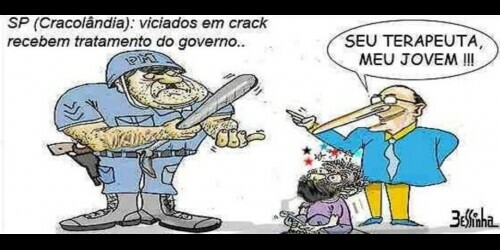 Acredito em políticas de redução de danos, que criam ligações com a realidade fora do crack. Aqui parece claro que a música deve ser usada em um programa de ensino, que estimule a responsabilidade dos dependentes. Eles serão respeitados pelo que sabem, ensinarão a toca. Aos poucos terão vontade de largar o vício. Defendo programas que levem trabalho, música, religião. Alivia o policiamento ostensivo e não sobrecarrega o sistema de saúde.
. Em outros países a violência é maior? Nos Estados Unidos, há menos usuários nas aglomerações de dependentes, mas eles são muito mais violentos. No Canadá também não há esse nível de sociabilidade. Isso é inédito em meus estudos e tem de ser estudado e usado para buscar soluções para o problema. Na Colômbia, eles são mais encurralados, ficam mais violentos, estão mais fora de controle. Em Três Esquinas, Bogotá, a polícia não entra, a não ser para invadir.
. Há modelo contra o problema? Existe uma crise no mundo. Ninguém sabe exatamente qual modelo usar. Se nem mesmo a biomedicina entende completamente o problema do crack, então é preciso usar a imaginação. Pensar de uma forma diferente, usar o contexto social e pensar em alternativas. Porque a tragédia do crack, embora as comunidades tenham características diferentes, é sempre parecida. Falamos em sociabilidade, mas claro que nem tudo é positivo. Se há pouca violência entre eles, isso também significa uma forma de sedução. 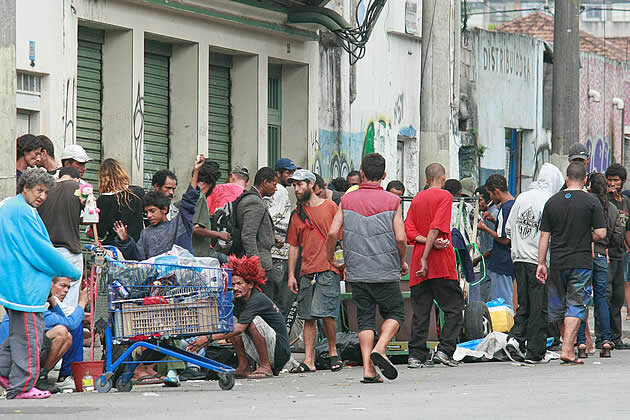 E, apesar de parecer um local mais leve, a devastação causada pela droga está toda ali: os mesmos corpos magros, a prostituição, mulheres grávidas, crianças dependentes. Também há gente que carrega cartas de recomendação, certificados de empregados do mês, fotos da família, que tenta agarrar-se à vida que tinha antes carregando papéis que a representam. Isso é outra característica comum, que deve ser enxergada como oportunidade: perceber que muitos estão ali, querem sair, mas não conseguem. É preciso, então, criar um ambiente de auxílio. Phillippe Bourgois, de 54 anos, nasceu no Upper East Side de Manhattan, New York. Depois de se formar em antropologia e viver na América Central, voltou ao seu país para estudar o problema das drogas. Viveu 5 anos no Harlem, New York, então tomado por traficantes. Pós-doutorado na área, contou as experiências em 2 livros. 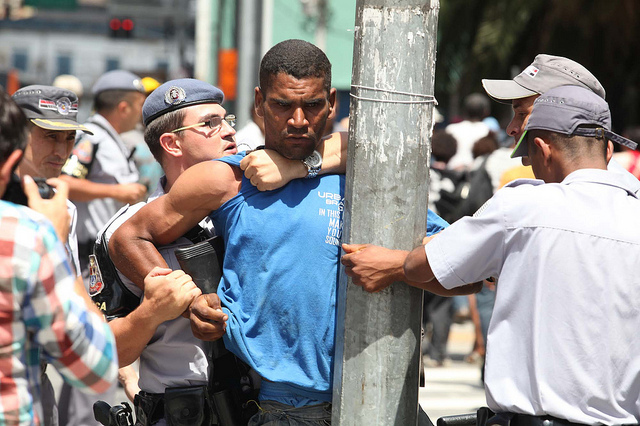 Philippe Bourgois (wearing a blue shirt) talks to a crack-cocaine user at Crackville-SP. Thanks for the comment... that's not much more one can say, right?